In recent years, many airbag lawsuits have been filed due to injuries and deaths resulting from overly aggressive airbag deployments. Airbags have taken on many names including aggressive airbags, less aggressive airbags, on aggressive airbags, smart airbags, depowered airbags, next generation airbags, second generation airbags, passenger side airbag, driver side airbag, side impact airbag, air bag, and just plain old ”airbags". The injuries from aggressive air bag deployment have also become too as well including severe whiplash, eye injuries, blindness, degloving, partial decapitation, quadriplegia and even death. According to airbag manufacturers and auto makers, air bags have been proved effective in doing the job for which they were designed. However, the air bag that saves an adult's life can kill a child. Manufacturers started installing driver side airbags in the late-1980's, on the passenger side by the early-1990's and in light trucks in the mid-1990's. The airbag system consists of three basic components - an airbag module, crash sensors and a diagnostic unit. Some systems may also have a switch which allows the airbag to be deactivated. Because airbag sensors measure deceleration, vehicle speed and damage are not good indicators of whether or not an airbag should have deployed. Front airbags are not designed to deploy in side impact, rear or rollover crashes. In fact in a rollover, very severe head injuries can occur if the airbag deploys at the same instant that the passenger or driver is out of position with his or her head next to the airbag as it explodes. Some defective airbags that have been recalled actually have known to deploy when the driver starts the vehicle or while they are just driving. In both cases, severe injuries often result. Once an airbag deploys, deflation begins immediately as the gas escapes through vent holes in the fabric. Airbags are supposed to be fully inflated before the passenger falls into it during a crash. Serious injuries occur when airbags, which can travel at speeds up to 175- 200 mph, hit occupants prior to full inflation. Airbags inflate, or deploy, quickly -- faster than the blink of an eye. Imagine taking one second and splitting it into one thousand parts. In the first 15 to 20 milliseconds, air bag sensors detect the crash and then send an electrical signal to fire the airbags. It is designed to allow the rocket fuel type propellant, usually sodium azide to ignite. The azide burns with tremendous speed, generating nitrogen, which inflates the airbags. Within 45 to 55 milliseconds the airbag is supposed to be fully inflated. Within 75 to 80 milliseconds, the airbag is deflated and the event is over. 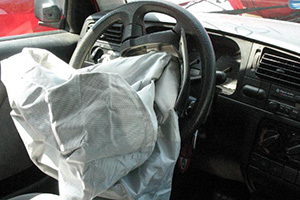 Air bags are designed to deploy in moderate to severe frontal collisions. They are not designed to deploy in side impact, rear impact or rollover collisions. Safety belts provide your best protection in these types of crashes. Safety belts also help keep vehicle occupants away from airbags when they are deploying, thus reducing the chances of airbag-induced injuries. In addition, safety belts help position the occupant properly to get the maximum benefit from the deploying airbag. Throughout the 1980s, manufacturers resisted installing airbags. They felt that safety did not sell vehicles and were worried about costs. They told the government that airbags would kill occupants, especially children. In early August 1996, NHTSA, expressing concern about children’s' deaths from air bags, proposed allowing manufacturers to install switches for passenger-side airbags in all types of vehicles. With those switches car makers will have to post four warning stickers relating to child safety in dual air-bag equipped cars. In 1998, manufacturers introduced so-called “second generation airbags” or "smart airbags". To the public, this sounded like a new design. In fact, all that manufacturers did was to use less propellant in their design. Virtually nothing else changed. Tests showed that these depowered air bags still passed the version of FMVSS 208 that manufacturers blamed for overly aggressive airbags. Most airbags that came equipped in vehicles manufactured prior to 1998, did not have a two stage airbag, also referred to as the next generation or smart airbag. These pre-1998 airbags were much more aggressive than they needed to be especially at lower speeds. At lower speeds and with smaller passengers and drivers, especially women and children, the excessive force of being hit by the airbag at speeds up to 200 mph, can have devastating results. Serious injuries, including whiplash, eye injuries, blindness, degloving, partial decapitation, quadriplegia and even death. Further, any statement or reference to past personal injury, products liability or SUV rollover lawsuits, settlements or verdicts should NOT be relied upon in one's own case or in your decision on which law firm to hire. All clients’ cases, facts, injuries, damages, venues and lawsuits are different and there is NO way to predict the outcome of a particular case, verdict of a jury or judge or the strength of a case before a judge, jury or the appellate court system. The client is responsible for all of their own medical expenses. All cases are handled on a contingent fee basis. NO attorney’s fees or case costs charged to client, unless a recovery is made for the client. Often in very serious and catastrophic injury and death cases Mr. Willis may associate with another products liability attorney as co-counsel and in other matters, the case may be referred. In cases where a legal matter is referred, Mr. Willis will continue to maintain joint responsibility with the handling attorney or lead counsel and actively monitor the progress and development of the case. Due to his 30+ years of experience in personal injury and products liability cases, Mr. Willis will often continue to assist in working with the hired experts and engineers and in research of the defective product or other related legal matters in the case.